Find the right tour for you through Opatija. We've got 83 tours going to Opatija, starting from just 4 days in length, and the longest tour is 30 days. The most popular month to go is September, which has the most number of tour departures. "I can’t speak highly of the crew on the Morena! 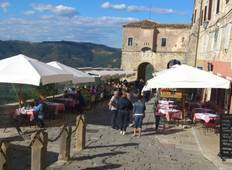 The accommodation, the meals; the..."
"Lunch is Motovun (truffles) was excellent. Dinner in Split which was fairly far away..."
"Iris and driver Pedra (Peter) are both dedicated and they genuinely take care of..."